Teresa Pocock is my 49-year old sister-in-law. She has Down syndrome and she is now living with Franke James and myself. On November 27, 2013, at the age of 49, Teresa was forced into a nursing home against her wishes and against the wishes of her father. Four days later, Teresa’s father went to the nursing home, and as her Senior Power of Attorney signed the paperwork to have her discharged, and Teresa returned home. But the police were called to force Teresa’s return to the nursing home. Luckily the police decided that Teresa was safe living with us. On World Down Syndrome Day, March 21st, we launched a petition asking the CCAC (Community Care Access Centre) and the Rekai Center to apologize for the harm they caused Teresa. Specifically Teresa is asking the CCAC to apologize for improperly taking away her human right to decide where she lives. She is asking the Rekai Centre to apologize for calling the police to force her back into their long-term care home. However, the Rekai Centre has still not apologized. The Rekai Centre CEO, Mary Hoare, has not responded in any way to Teresa’s petition. Are they trying to ignore Teresa? Hoping that the problem will just go away? 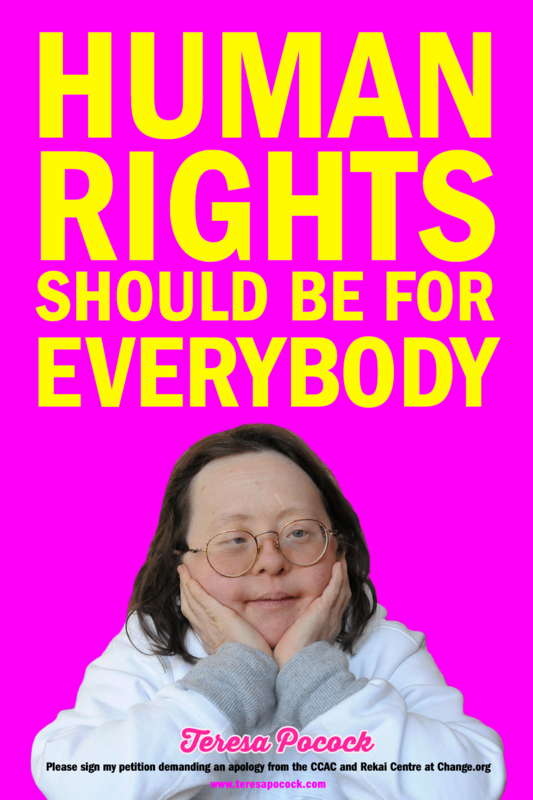 Teresa’s human rights should never have been disabled. That is why we need more people to sign her petition, and demand an apology from the Rekai Centre. Please sign: Teresa’s Petition at Change.org.